Ministering at the retreat/conference in Missoula, Montana. 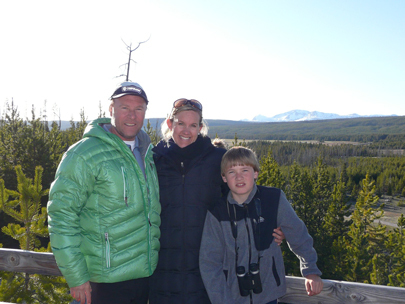 We recently returned from ministering in Missoula, Montana at a conference/retreat. We did a workshop together for the conference on being "Naturally Supernatural" sharing about letting the Holy Spirit use each one of us as God's children in the unique way He created us with our individual personalities. be like or imitate someone else. Bringing to life the concept from the Protestant Reformation of "The Priesthood of All Believers" it was exciting to see the Holy Spirit light that truth up. We ended up having the most popular workshop for the event—even though it was added on late in the planning—it was a blessing to see the Spirit of God filling, equipping, and empowering those who came in very dramatic fashion as the Holy Spirit fell in power. In fact a couple of young ladies who were ministered to in our workshop got filled in a very powerful way for the first time in their lives and were so impacted by the presence of God that they were glued to the floor for over an hour, long after the workshop was over, receiving and receiving the poured out love and mercy of the Lord. Our friend Silvina Kosacki who was speaking at the main event sat in on our workshop and told us she cried the whole time through our teaching as the Spirit of God kept touching her as we spoke—Glory!! 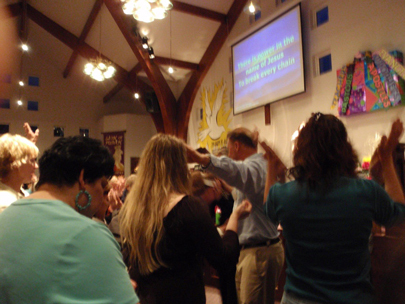 We also experienced some powerful healings: there was a woman I prayed for who was powerfully and instantly healed. She opened her eyes right in the middle as I was praying and exclaimed, "Oh my goodness, I can't believe this, the pain is gone!" She had been with constant throbbing head pain for over seven years which would never stop. She was pain-free for the first time and said that this was also the first time she’d smiled in seven years. The next day she came rushing right up and told us it was the best night’s sleep she'd had in seven years as well—glory to God! Another woman was also healed of pain in her body and she also experienced her best night of sleep in years afterwards as well!! We connected with one of the sisters who was helping to lead the conference whose daughter had been in a very bad accident, we went out for a day to her house in the country to pray for her which also led to all of us praying for one another in a powerful way and then having a hike in the scenic mountains there by Missoula. We found out that an old friend, Steve Zarit, who we were connected with from the Anaheim Vineyard as well as Lonnie Frisbee, was living close to Missoula. He had been battling some serious health issues so we were blessed to be able to connect up with him and spend some time catching up on things with each other and get to pray for him as well. Then of all things, we got an email from Kosovo in Eastern Europe where we have traveled and ministered before, from our Pastor friend Skender, telling us one of the sisters from Kosovo whom we had ministered to when we were in Kosovo was in Montana not too far from us and that she would love to connect up while we were in Montana. 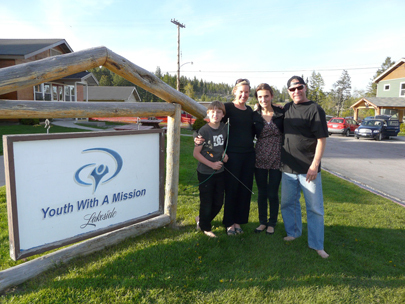 Montana is a big state so we hit those long Montana roads again and went further up north after the conference and divine appointments we’d had in Missoula, and made our way up to the YWAM base that our friend from Kosovo, Argolida Kela, was staying at. Since it was a bit of a drive to the YWAM base up in Lakeside by Flathead Lake, we ended up spending some time and staying up there at the base. This led to us not only getting to spend time with Argolida and pray for her—she shared that we gave her a word that truly blessed her and that was about her future ministry she was feeling called to, details that there was no way we could know God had put in her heart, Glory!—but we also got to pray for her friend and roommate, as well as getting to meet and share with many others there on the base, spending time sharing some Holy Ghost stories about God’s adventures he has taken us on. With Argolida Kela from Kosovo at the YWAM base in Lakeside and some beautiful Montana views. We had another divine appointment of provision that was pretty unusual and is rather fitting with Montana and its trout-filled rivers running through it. A worker at the hotel we were staying at for the conference whom I ended up connecting with and talking to a few times, came up one morning wanting to know if I would be interested in buying a fly-fishing rig. I wasn’t that interested at first since I was expecting a hefty price, that stuff doesn’t go cheap. He told me someone, they don’t know who, had left it at the hotel and it had been sitting there for a year so the hotel wanted it sold and out of there. I offered twenty bucks and couldn’t believe they accepted my offer, so I ended up getting a brand new 400 dollar fly fishing rig for only twenty bucks—we ended up putting it to use and landing a few at that, thanks to God’s unique and unusual provision. I remember our old friend Harald Bredesen, a father of the Charismatic Renewal, saying that sometimes God lets a small trial happen to you to keep something worse from happening to you later. One week before we left for Montana I hit a deer while driving out in our local mountains. I had to wonder what that was all about and why it took place. It really shook me up though and made me aware of the dangers of that type of accident and of the need to proceed carefully in mountain areas where animals are out and about. We took off for Montana and after a few days of driving we were almost out to our destination in Missoula. We took a scenic route through the mountains for our last leg of the drive and were enjoying the awesome views, when it hit me as the sun began to sink how dangerous it can actually be driving in the mountains—if there are deer in the mountains of overdeveloped Southern California, how many could be out here? I became very aware of the need to proceed with caution—thank God!! After a while of driving everything seemed mellow so just when I was letting my guard down a bit, a big herd of elk came suddenly running out onto the road (elk are like deer on steroids—way bigger and thus will do that much more damage if you happen to run into them.) I braked just in the nick of time; it would have been disastrous in that spot if we had hit one as there was a river on one side and a steep cliff on the other—no room for error and this was a big herd with lots of them running all over. Another small group of elk ran out in front of us again soon afterward and we just missed them too. We avoided what could have been life-threatening accidents then, and once again soon afterward. As we proceeded on near Missoula the Holy Spirit warned me to slow way down even more. Mercedes even said, "What's up? Why are you driving so slow? We will never get there at this rate." Right at that moment I saw just down the road ahead of us, tail and head lights spinning all over the road, just ahead of where we were. A police car on the other side of the road writing someone a ticket jumped in his car and whipped around right next to us and flipped his lights on and sped past us flying up the road about 500 yards or so. We rolled up to a six or seven car pile up with cars crashed all over the road—they had smashed into signs and trees and each other—it was complete mayhem with crashed cars everywhere—one of the worst pileups I've seen in a very long time. We were one of the first cars on the scene except for that one police car, I pulled over to the side and started to get out seeing if I could help, but of course the police yelled for me to get back in the car. In a few moments, about 20 police cars and ambulances and fire trucks, the whole Montana EMT cavalry came rolling in. It struck me as we watched the whole surreal scene unfold before us, what a close call this was: thirty seconds faster on the road and we would have been in the middle of the whole thing as another victim in the middle of the mayhem. The Holy Spirit's warning and the deer crash right before the trip woke me up to the dangers of rural roads—something we can often overlook in the over-paved landscape that we live in. We were told by a number of people that that road where the pile up took place is the most dangerous road in the whole country. Thank God for His protection and warning and the pre-emptive strike to make us aware as we proceeded into dangerous animal-ridden road territory! When you’re in a place like Montana and you can take a little time, it is worth it to get out and see some of the glorious scenery that surrounds the countryside—there is a reason they filmed A River Runs Through It on location, because the locations are beautiful. 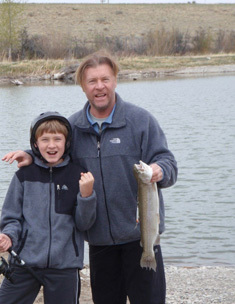 Yellowstone scenes and a successful fishing venture. 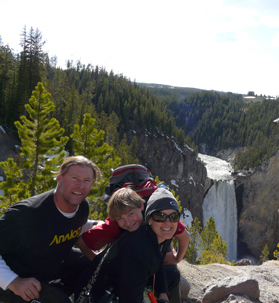 We were blessed after a lot of ministry to be able to drive down to Yellowstone National Park and spend a little time there and see some of the awesome sights and geysers and animals that just cover the land there. 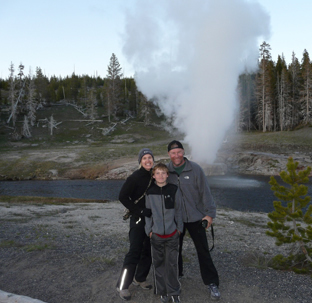 From bear to bison and elk everywhere along with boiling mud pots and geysers like Old Faithful and others, we felt truly blessed and refreshed to be able to spend some time in America’s first National Park. It made us glad we had chosen to drive the long roads all the way up rather than fly and see nothing but grumpy flight attendants overcharging for luggage and then shoving you into an excuse for a seat. We also had plenty of time on the road to hear the voice of the Holy Spirit speaking about God’s heart for this unique and beautiful nation of ours and for the Lord’s desire to revive America! Hallelujah!